On Monday, the Board of Cricket Control in India (BCCI) announced a strong 15-member squad for the World Cup 2019. Led by Virat Kohli, the squad looks covered in most of the departments. However, the selectors have taken everyone by surprise with their decision about the pacers. While speculations about the fourth pacer in the squad were rife until a few days ago, the selectors have decided against picking one. 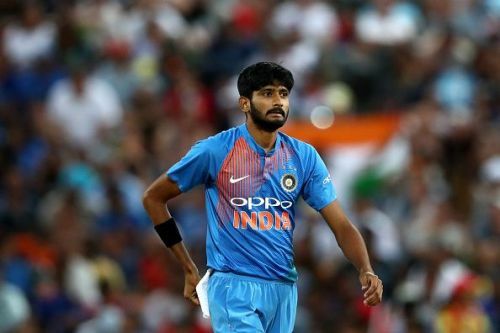 Thus, it means that India will play with only three frontline pacers in the upcoming mega event, with Jasprit Bumrah, Bhuvneshwar Kumar and Mohammed Shami being the three preferred men for this job. Hardik Pandya could take up the role of the fourth pacer in the team. The decision to pick just three frontline pacers in the squad has perplexed quite a few. Conditions in England are usually favorable to the fast bowlers. With the overcast conditions, the ball swings around as well. India will be playing its first three games in Southampton, London, and Nottingham where the conditions are seamer friendly. Moreover, with just three seamers available, they will have a lot of work to do at the nets. Even though the team can source some local fast bowlers for these practice sessions, they might not be of the highest quality. Thus, the BCCI has taken the decision to send in four additional frontline fast bowlers to England along with the team. Navdeep Saini, Deepak Chahar, Avesh Khan, and Khaleel Ahmed will be these four bowlers. Navdeep and Deepak have been impressive in the ongoing IPL. On the other hand, Khaleel has been around with the team for a while now and is a work in progress. He is getting better by the day and this will be a great experience for the left-arm pacer. Avesh Khan is the other pick who has had a good domestic season. Deepak Chahar, Khaleel Ahmed and Navdeep Saini are currently playing the IPL. They have been an integral part of their respective franchises and have got a big role to play going ahead in the tournament.